Marriage*: She married Matthew M. Naudain, son of James Schee Naudain and Ann Mountain, in October 1849. Other Names*: Susan Torbert Naudain, Susan Naudain. [S1074] 1880 U.S. Census, Cecil County, Md., schedule 1, 3rd election dist., p. 11, dwelling 72, family 72 (indicating that she was born in Delaware in 1816 or 1817 and suffered with paralysis). Birth*: He was born on 23 March 1803. Death*: He died on 1 April 1803. [S1] Ruth Bennett, Naudain Family of Delaware (Geneva, Neb. : n.pub., 1941), p. 51. This material is a typescript of "notes" in Ms. Bennett's possession and apparently was originally written and compiled by James W. Lattomus. Copies are with the D.A.R. Library, Washington, D.C., and Roger Bartlett, Austin, Tex., and can be viewed at http://www.rabgenealogy.com/ui53.htm. The notes contain some inconsistencies, and page 45 was missing from the D.A.R. Library copy when it was copied. Birth*: She was born on 22 June 1804. Death*: She died on 2 July 1804. Marriage*: She married Henry Higgins. Birth*: She was born on 20 November 1805. Marriage*: He married Elizabeth Rebecca Reynolds, daughter of William Reynolds and Elizabeth Naudain. Birth*: She was born on 29 September 1807. Birth*: He was born on 9 March 1810. Death*: He died on 15 September 1811 at age 1. Birth*: She was born on 4 March 1812. Birth*: He was born on 4 December 1813. Marriage*: He married Mary G. Moore before 1836. Marriage*: He married Caroline C. Fenimore after 1842. Death*: He died in March 1898 in Middletown, New Castle County, Delaware, at age 84. Note*: He was the only son who survived infancy. At age 15 he went to work for John McDowell, a Dover merchant, and the next year with William B. Janvier, where he remained until age 18. He took up farming at age 22 and later bought Glenwood Farm near Newark, Delaware. He opened a general store in Newark in 1861, moved it to Middletown in 1864, and took in his sons, Edward and Samuel. He was elected to the Delaware General Assembly in 1852 as a Whig and in 1867 was appointed as a trustee of Delaware College, which he held for many years. For many years he was a director of Citizens Bank of Middletown. Ruth Bennett's "Naudain Family of Delaware" says, at p. 51, that "by his genial disposition and unquestioned integrity, he won a high place in the esteem and confidence of those who knew him." [S1] Ruth Bennett, Naudain Family of Delaware (Geneva, Neb. : n.pub., 1941), pp. 51-52. This material is a typescript of "notes" in Ms. Bennett's possession and apparently was originally written and compiled by James W. Lattomus. Copies are with the D.A.R. Library, Washington, D.C., and Roger Bartlett, Austin, Tex., and can be viewed at http://www.rabgenealogy.com/ui53.htm. The notes contain some inconsistencies, and page 45 was missing from the D.A.R. Library copy when it was copied. Marriage*: She married John Arnold Reynolds, son of William Reynolds and Elizabeth Naudain, before 1836. Marriage*: She married John Arnold Reynolds, son of William Reynolds and Elizabeth Naudain, after 1842. Birth*: She was born on 14 November 1815. Marriage*: She married Fletcher Williamson. Birth*: She was born on 8 September 1817. Marriage*: He married Margaret Wilhelmina Reynolds, daughter of William Reynolds and Elizabeth Naudain. Birth*: She was born on 29 October 1820. Death*: She died in April 1898 at age 77. Other Names*: S. Naudain Duer, Snow Duer. Note*: • He was a physician and took over his father's practice. They lived in Newton Square, a Philadelphia suburb. [S1] Ruth Bennett, Naudain Family of Delaware (Geneva, Neb. : n.pub., 1941), p. 96 (naming Edward Louis Duer, M.D. as his father). This material is a typescript of "notes" in Ms. Bennett's possession and apparently was originally written and compiled by James W. Lattomus. Copies are with the D.A.R. Library, Washington, D.C., and Roger Bartlett, Austin, Tex., and can be viewed at http://www.rabgenealogy.com/ui53.htm. The notes contain some inconsistencies, and page 45 was missing from the D.A.R. Library copy when it was copied. [S961] Find A Grave, online at http://www.findagrave.com, memorial for Dr. S. Naudain Duer, Sr., memorial no. 114780850, viewed on 20 Jul 2016 (giving the year but no other information). [S1] Ruth Bennett, Naudain Family of Delaware, above, p. 96 (giving the date but not the place). [S1367] The Philadelphia Inquirer, Philadelphia, Pa., online at http://www.newspapers.com, 23 Jun 1928, p. 16, col. 7 (obituary of Dr. S. Naudain Duer). [S1367] The Philadelphia Inquirer, Philadelphia, Pa., online at http://www.newspapers.com, 26 Jun 1928, p. 7, col. 3 (obituary of Dr. S. Naudain Duer) (item about funeral and burial). [S961] Find A Grave, online, above, memorial for Dr. S. Naudain Duer, Sr., memorial no. 114780850, viewed on 20 Jul 2016. [S1] Ruth Bennett, Naudain Family of Delaware, above, p. 96 (first bullet). [S1367] The Philadelphia Inquirer, Philadelphia, Pa., online at http://www.newspapers.com, 23 Jun 1928, p. 16, col. 7 (obituary of Dr. S. Naudain Duer) (second bullet). Marriage*: He married Mary Cochran, daughter of Robert Thomas Cochran and Elizabeth R. Moody, on 6 December 1865. Birth*: He was born on 1 August 1942. [S1] Ruth Bennett, Naudain Family of Delaware (Geneva, Neb. : n.pub., 1941), pp. 51-53. This material is a typescript of "notes" in Ms. Bennett's possession and apparently was originally written and compiled by James W. Lattomus. Copies are with the D.A.R. Library, Washington, D.C., and Roger Bartlett, Austin, Tex., and can be viewed at http://www.rabgenealogy.com/ui53.htm. The notes contain some inconsistencies, and page 45 was missing from the D.A.R. Library copy when it was copied. Birth*: He was born in December 1836. Marriage*: He married Martha C. Rothwell on 2 November 1861. Death*: He died on 2 March 1877 at age 40. [S1] Ruth Bennett, Naudain Family of Delaware (Geneva, Neb. : n.pub., 1941), p. 52. This material is a typescript of "notes" in Ms. Bennett's possession and apparently was originally written and compiled by James W. Lattomus. Copies are with the D.A.R. Library, Washington, D.C., and Roger Bartlett, Austin, Tex., and can be viewed at http://www.rabgenealogy.com/ui53.htm. The notes contain some inconsistencies, and page 45 was missing from the D.A.R. Library copy when it was copied. Marriage*: She married William Reynolds, son of John Arnold Reynolds and Mary G. Moore, on 2 November 1861. Marriage*: He married Charlotte Bower. Birth*: He was born circa 1838. Marriage*: She married John A. Reynolds, son of John Arnold Reynolds and Mary G. Moore. Note*: She was from Pencader Hundred. Other Names*: Josephine Poe Duer, Josephine Duer, Mrs. S. Naudain Duer. Note*: • She was from Baltimore, Maryland. • The sources conflict as to her mother's identity. A family history says Anna J. Hough was her mother; her obituary says Anne Johnson was her mother. • She was active in numerous social and charitable groups, including the Philadelphia Orchestra, the Colonial Dames of America, the Philadelphia Chapter of the Daughters of the Confederacy, Beaver Camp (a girls' camp in Maine), the Robert E. Lee Memorial Foundation, Inc., and the Philadelphia Charity Ball. [S1367] The Philadelphia Inquirer, Philadelphia, Pa., online at http://www.newspapers.com, 26 Feb 1952, p. 20, col. 3 (obituary for Mrs. S. Naudain Duer) (naming Anne Johnson as her mother). [S961] Find A Grave, online at http://www.findagrave.com, memorial for Josephine Poe Duer, memorial no. 114780832, viewed on 20 Jul 2016 (giving the year but no other information). [S1367] The Philadelphia Inquirer, Philadelphia, Pa., online at http://www.newspapers.com, 26 Feb 1952, p. 20, col. 3 (obituary for Mrs. S. Naudain Duer) (stating that she was born in Baltimore, Md. ; not giving the date but stating that she was eighty-three years old when she died on 25 Feb 1952). [S1] Ruth Bennett, Naudain Family of Delaware (Geneva, Neb. : n.pub., 1941), p. 96 (giving the date but not the place). This material is a typescript of "notes" in Ms. Bennett's possession and apparently was originally written and compiled by James W. Lattomus. Copies are with the D.A.R. Library, Washington, D.C., and Roger Bartlett, Austin, Tex., and can be viewed at http://www.rabgenealogy.com/ui53.htm. The notes contain some inconsistencies, and page 45 was missing from the D.A.R. Library copy when it was copied. [S1367] The Philadelphia Inquirer, Philadelphia, Pa., online at http://www.newspapers.com, 26 Feb 1952, p. 20, col. 3 (obituary for Mrs. S. Naudain Duer). [S961] Find A Grave, online, above, memorial for Josephine Poe Duer, memorial no. 114780832, viewed on 20 Jul 2016. [S1355] Evening Ledger, Philadelphia, Pa., online at http://www.newspapers.com, 15 Apr 1920, p. 11, col. 2. [S1367] The Philadelphia Inquirer, Philadelphia, Pa., online at http://www.newspapers.com, 26 Feb 1952, p. 20, col. 3 (obituary for Mrs. S. Naudain Duer) (first bullet). [S948] Ezra Patterson Carrell, The Descendants of James Carrell and Sarah Dungan, His Wife, above, p. 592 (second bullet). [S1367] The Philadelphia Inquirer, Philadelphia, Pa., online at http://www.newspapers.com, 26 Feb 1952, p. 20, col. 3 (obituary for Mrs. S. Naudain Duer) (second bullet). [S1367] The Philadelphia Inquirer, Philadelphia, Pa., online at http://www.newspapers.com, 26 Feb 1952, p. 20, col. 3 (obituary for Mrs. S. Naudain Duer) (third bullet). [S1367] The Philadelphia Inquirer, Philadelphia, Pa., online at http://www.newspapers.com, 26 Feb 1952, p. 20, col. 3 (obituary for Mrs. S. Naudain Duer) (fourth bullet). [S948] Ezra Patterson Carrell, The Descendants of James Carrell and Sarah Dungan, His Wife, above, p. 592 (naming Josephine Poe as his mother). Marriage*: She married Samuel M. Reynolds, son of John Arnold Reynolds and Mary G. Moore, on 6 December 1865. [S1] Ruth Bennett, Naudain Family of Delaware (Geneva, Neb. : n.pub., 1941), pp. 52-53. This material is a typescript of "notes" in Ms. Bennett's possession and apparently was originally written and compiled by James W. Lattomus. Copies are with the D.A.R. Library, Washington, D.C., and Roger Bartlett, Austin, Tex., and can be viewed at http://www.rabgenealogy.com/ui53.htm. The notes contain some inconsistencies, and page 45 was missing from the D.A.R. Library copy when it was copied. Marriage*: He married Fanny Cochran, daughter of Richard R. Cochran. [S1] Ruth Bennett, Naudain Family of Delaware (Geneva, Neb. : n.pub., 1941), p. 53. This material is a typescript of "notes" in Ms. Bennett's possession and apparently was originally written and compiled by James W. Lattomus. Copies are with the D.A.R. Library, Washington, D.C., and Roger Bartlett, Austin, Tex., and can be viewed at http://www.rabgenealogy.com/ui53.htm. The notes contain some inconsistencies, and page 45 was missing from the D.A.R. Library copy when it was copied. Marriage*: He married Elizabeth Wilson after 1861. Death*: He died in April 1877. Note*: He lived with his mother on her farm until it was sold in 1862. He later married Elizabeth Wilson and lived in Newark, Delaware, in a large brick house, known as Linden Hall, that faced the Delaware College farm near the Pennsylvania Railroad station. He and Elizabeth had no children. Marriage*: She married John A. Moody, son of Alexander Moody and Maria Naudain, after 1861. Note*: She was from Newark, Delaware. Birth*: She was born in 1814. Marriage*: She married Robert Thomas Cochran. Death*: She died on 30 January 1848. Note*: Her husband, Robert, later married her sister, Sophia. Robert T. Cochran's tombstone, Forest Cemetery, Middletown, Del. Marriage*: He married Elizabeth R. Moody, daughter of Alexander Moody and Maria Naudain. Note*: He was a wealthy farmer from St. Georges Hundred. 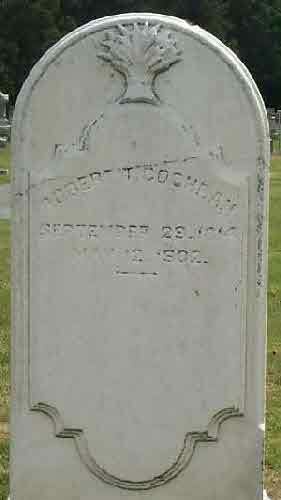 [S1148] Ruth Stonesifer, Delaware Family Genealogies, online, above, viewed 3 Sep 2007 (image of grave marker stating that she was the wife of Robert T. Cochran). [S111] Supposition as to date, based on the date of his prior wife's death and the birth date of Robert and Sophia's child. [S1148] Ruth Stonesifer, Delaware Family Genealogies, online, above, viewed 3 Sep 2007 (image of grave marker naming Robert T. Cochran as his father). Sophia Moody Cochran's tombstone, Forest Cemetery, Middletown, Del. Note*: Her husband, Robert, had been married to her sister, Elizabeth. [S1148] Ruth Stonesifer, Delaware Family Genealogies, online http://rstonesifer.com/genealogy.htm, viewed 3 Sep 2007 (image of grave marker) (not giving the date but stating that she was thirty-five years old when she died on 21 Oct 1851). [S1343] Journal-Every Evening, Wilmington, Del., online at http://www.newspapers.com, 4 Sep 1922, p. 1, col. 5 (obituary of Robert A. Cochran) (naming Sophia Moody as his mother). 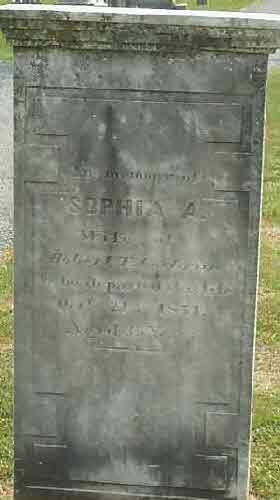 [S1148] Ruth Stonesifer, Delaware Family Genealogies, online, above, viewed 3 Sep 2007 (image of grave marker naming Sophia A. Cochran as his mother). Marriage*: She married Edward F. Nowland. Marriage*: He married Alice F. Cochran, daughter of Robert Thomas Cochran and Elizabeth R. Moody. Marriage*: She married Richard Cochran, son of Robert Thomas Cochran and Elizabeth R. Moody. Marriage*: He married Margaret Hardcastle. Marriage*: She married Thomas Cochran, son of Robert Thomas Cochran and Elizabeth R. Moody. 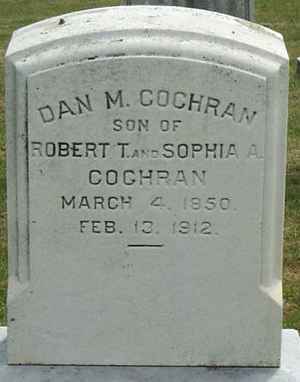 Dan M. Cochran's tombstone, Forest Cemetery, Middletown, Del. [S1148] Ruth Stonesifer, Delaware Family Genealogies, online, above, viewed 3 Sep 2007 (image of her grave marker stating that she was the wife of Dan M. Cochran). 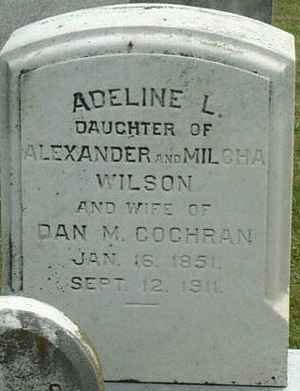 Adeline Wilson Cochran's tombstone, Forest Cemetery, Middletown, Del. [S1148] Ruth Stonesifer, Delaware Family Genealogies, online http://rstonesifer.com/genealogy.htm, viewed 3 Sep 2007 (image of grave marker naming Alexander Wilson as her father). [S1148] Ruth Stonesifer, Delaware Family Genealogies, online, above, viewed 3 Sep 2007 (image of grave marker naming Milcha Wilson as her mother). [S1] Ruth Bennett, Naudain Family of Delaware, above, (stating that her name was Adelaide). Birth*: He was born on 24 September 1742. Birth*: She was born on 12 October 1750. Marriage*: She married Dennis J. Nowland. Birth*: She was born on 19 January 1777. Marriage*: He married Mary Mansfield Foard, daughter of Edward Foard and Sarah Mansfield. Marriage*: He married Jemima Foard, daughter of Edward Foard and Sarah Mansfield, before 1826. Note*: He and his wife were from near Warwick, Maryland. [S1] Ruth Bennett, Naudain Family of Delaware (Geneva, Neb. : n.pub., 1941), pp. 53, 76. This material is a typescript of "notes" in Ms. Bennett's possession and apparently was originally written and compiled by James W. Lattomus. Copies are with the D.A.R. Library, Washington, D.C., and Roger Bartlett, Austin, Tex., and can be viewed at http://www.rabgenealogy.com/ui53.htm. The notes contain some inconsistencies, and page 45 was missing from the D.A.R. Library copy when it was copied. [S720] Dorothy Colburn, comp., Old Drawyers: The First Presbyterian Church in St. George's Hundred (Odessa, Del. : n.pub., 1989), pp. 200 (stating that she was born in 1812), 280 (stating that she died on 20 Apr 1843 at age thirty-one years), 299 (stating that she was born in 1812), 326 (stating that she was born in 1812). [S720] Dorothy Colburn, comp., Old Drawyers: The First Presbyterian Church in St. George's Hundred, above, pp. 200 (not giving the date), 201 (giving her name as Ann Elizabeth _____ and not giving the date), 280 (giving her name as Ann Elizabeth Naudain and not giving the date). [S1082] William Henry Egle, Pennsylvania Genealogies, Chiefly Scotch-Irish and German (Harrisburg, Penn. : Harrisburg Pub. Co., 1896), p. 329. [S720] Dorothy Colburn, comp., Old Drawyers: The First Presbyterian Church in St. George's Hundred, above, pp. 200 (giving only the year and not naming the place), 280 (giving the date but not naming the place), 299 (giving only the year and not naming the place), 326 (giving only the year and not naming the place). [S720] Dorothy Colburn, comp., Old Drawyers: The First Presbyterian Church in St. George's Hundred, above, pp. 280, 299, 326. [S720] Dorothy Colburn, comp., Old Drawyers: The First Presbyterian Church in St. George's Hundred, above, pp. 200 (naming Mrs. Ann Elizabeth Naudain as his mother), 201 (naming Ann E. Naudain as his mother), 280 (naming Ann E. Naudain as his mother). [S961] Find A Grave, online at http://www.findagrave.com, memorial for viewed on 3 Apr 2010 (James B. Naudain, memorial no. 5086675) (naming Anna E. Naudain as his mother). [S1] Ruth Bennett, Naudain Family of Delaware (Geneva, Neb. : n.pub., 1941), p. 95 (naming Ann Elizabeth Blackston as her mother). This material is a typescript of "notes" in Ms. Bennett's possession and apparently was originally written and compiled by James W. Lattomus. Copies are with the D.A.R. Library, Washington, D.C., and Roger Bartlett, Austin, Tex., and can be viewed at http://www.rabgenealogy.com/ui53.htm. The notes contain some inconsistencies, and page 45 was missing from the D.A.R. Library copy when it was copied. Marriage*: He married Hannah Maria Hepburn. Marriage*: She married William Henry Blackiston, son of James Blackiston and Jemima Foard. Note*: She was from Pennsylvania. Marriage*: He married Jemima Foard, daughter of Edward Foard and Sarah Mansfield, before 1827.